Ryanair, the Irish budget airline with fares as low as 0p, will have to shift a lot of seats to fund its 1.5bn euro ($1.9bn; £1bn) bid for Aer Lingus. But then, that is what Ryanair does best. No frills, no "ocean liners of the skies" nonsense, just bums on seats - and nearly 40 million a year at the last count. 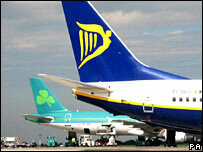 Under the outspoken stewardship of Michael O'Leary, it has become one of the world's most successful carriers. And days after Aer Lingus made its debut on the London and Dublin stock markets, he has made a takeover bid. The combined airline would carry more than 50 million passengers annually and, according to Mr O'Leary, be "capable of competing on the European and world stage against other large European airline groups". A successful deal would represent a remarkable ascent for the airline since its debut in 1985. Ryanair started out with a 15 seat Embraer turboprop plane flying between London's Gatwick airport and Waterford, in southern Ireland. 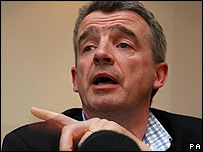 But it was a couple of major decisions in the 1990s that fuelled Ryanair's rapid rise to become a major European airline. First came a trip to the US, where Mr O'Leary studied the low-cost, no-frills budget airline model pioneered by Southwest Airlines. Ryanair soon started taking European market share away from the national carriers as it took the same approach - operating a single type of aircraft, speeding up turnaround times and flying to smaller regional airports that offered financial incentives to attract new airlines. In 1997 Ryanair really hit the jet stream, when the European Union deregulated the air industry, allowing airlines from one EU country to operate scheduled flights between other EU states. The following years saw rapid expansion. A successful flotation enabled Ryanair to invest heavily in growing its fleet, a pioneering online booking system helped it to slash prices and the acquisition of struggling budget rival Buzz gave it more routes and airport slots. Ryanair says the bid is a "unique opportunity"
With a list of 115 European destinations served by more than 750 flights a day, it is now firmly established among the major European airlines. And in an era when airlines are struggling to stay solvent amid record fuel prices, security alerts and cut-throat competition, Ryanair's profits are the envy of some rivals - they rose 12% to 302m euros in the last financial year. A tie-up with Aer Lingus would give Ryanair its first access to long-haul routes, both to the US and the Middle-East, and Mr O'Leary could have ambitious plans to unleash the budget model on this sector. However, analysts are predicting some major turbulence if he does pull off his Aer Lingus purchase. There are competition concerns, although only 17 of the two airlines' routes are duplicated. The particular focus will be on the Dublin to London route, where the combined group would have a 78% share of flights. According to Nick van den Brul, airline analyst at BNP Paribas, the two airlines would have to give up slots and open up the market to more competition. A second area of concern could be the unions. Irish union Siptu represents about 1,800 Aer Lingus workers, and was opposed to the privatisation of the airline in the first place. Although Mr O'Leary has said he will respect their arrangements and operate the two airlines as two separate entities, union staff will be aware of some high profile stories about working conditions at Ryanair. Staff have to buy their own uniforms and last year were banned from charging their own mobile phones at work. Last February, an undercover Channel 4 documentary highlighted the airline's training and security policies and revealed poor staff morale. But despite these potential hurdles, most analysts think a deal is possible, although Ryanair will probably have to up its offer. 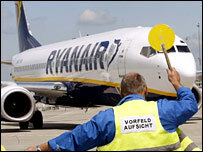 Lloyd Brown, aviation analyst at consultants Ernst & Young, said Ryanair would lose a lot of the benefits from a merged airline if the two carriers were operated separately. "I can see the two airlines as two separate brands, but Mr O'Leary will want to apply Ryanair's model and profit margins to Aer Lingus' operations if he is to justify the premium he will pay for the company." Mr Lloyd also points out the fact that Ryanair bases its operations model heavily on that of Southwest Airlines, which has a strict "no acquisitions" policy. "Takeovers are disruptive, and considering Mr O'Leary has said he will step down from Ryanair in 2008, you have to ask if he will be there to see the thing through."